Saturday we began the day with 32 teams in the NCAA Tournament field. Now, we're down to 24, and by Sunday night, we'll have 16. Such are the stakes -- and the lure -- of March Madness. Win and advance, lose and and watch the rest of the tournament unfold at home from your couch. The first day of the second round set the tone for what has already been a tremendous opening weekend. Wofford nearly pulled an upset on Kentucky and LSU, without its suspended coach, defeated Maryland in a rare collapse-turned-quazi-buzzer-beater. Saturday is Saturday, though. Life calls. Your yard probably needed to be mowed, your gutters cleaned, your car detailed. We get it. You probably missed some stuff along the way. That's why we painstakingly watched every game with intense scrutiny to bring you an all-encompassing recap of the third full day of the Big Dance. Allow me to break some very non-breaking, very non-surprising news: One of the best teams without its best player is not at its best without said best player. Kentucky survived Saturday. Barely. And it did so by doing something well it hadn't done well most of the season: Defending the 3-point line. They forced a very good offensive team in Wofford to shoot just 8 of 27 from three-point range, and the Terriers' best player, Fletcher Magee, missed all 12 of his triples in part because UK hounded him on the perimeter. But the difference between 'Wow, that was a great defensive outing' and 'Wow, I can't believe Kentucky choked and is going home before the Sweet 16' is a Magee three dropping here or there, a couple of defensive missteps. The Cats' win Saturday was impressive, but it's also more evidence that Kentucky without PJ Washington -- who is dealing with a sprained foot and has missed both of Kentucky's NCAA Tournament games -- is far from unbeatable. "I may not be showing it right now, but I'm ecstatic when my team wins," said John Calipari, adding that PJ Washington's absence could have affected how UK closed. Kansas -- oh boy. Where to begin? In a season where its Big 12 regular season streak of championships came to a screeching halt, it's only fitting that KU's second round game against Auburn provided a 26-point halftime deficit -- the largest in Kansas's illustrious NCAA Tournament history. Kansas made a run back to make it less embarrassing overall in a 89-75 final score, but this is a season-ending loss that a proud program like Kansas is none too familiar with. LSU was one of the most popular higher-seeded teams people picked to get upset in the first or second round this season -- and with good reason. Its coach, Will Wade, happens to be suspended indefinitely. And the reason: There are reportedly wiretaps in the custody of the feds that illustrate Wade discussing a "strong a--" offer to a former recruit. And oh, by the way, the recruit in question is Javonte Smart, a current Tigers freshman. But LSU keeps winning regardless, even without Will Wade, who missed his fourth consecutive game on Saturday. It's not because interim coach Tony Bedford is an elite tactician, or that their path has been any easier than anyone else's. He's not, and it hasn't been. It's that Wade stocked the roster with some absolute studs -- Tremont Waters, Naz Reid, Kavell Bigby-Williams, Emmitt Williams, and yes, Javonte Smart -- all former top-100 recruits. Talent-for-talent, LSU can match up well with anyone in the East Regional. How far talent, without a head coach and with distractions and adversity, can take you is one of the more fascinating storylines of the tourney with the Tigers. Michigan began the 2018-19 campaign on a 17-0 rampage. It then went 9-5 to close the regular season, lost to Michigan State in the Big Ten Tournament title game, and slipped to a No. 2 seed a mere month from looking like a viable candidate to cruise to a No. 1 seed in the NCAA Tournament. The Wolverines' slip was noticeable, and their drop to a No. 2 seed was warranted. But in that span, star Charles Matthews battled injury, and as a result. Michigan battled with a bit of an identity crisis. That crisis now appears to be over. Charles Matthews looks fully healthy again, and Michigan has resumed its dominant defensive ways. Saturday the Wolverines held Florida to 49 points -- the Gators' lowest-scoring output all season -- just two days after limiting Montana to 55 points in the first round. Consider the great version of Michigan -- the one that opened its season 17-0 -- officially back. The question everyone -- including NBA scouts -- wanted to know coming into Saturday: How would Ja Morant fare against NBA-level athletes? The answer everyone -- including NBA scouts -- received: 28 points, 5 of 6 shooting from three, five rebounds, two steals, four assists and one block. 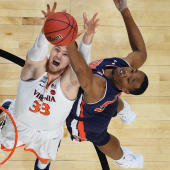 Morant did as much as he was capable of against Florida State's long and athletic backcourt, and fared OK driving into the teeth of its frontcourt. But he couldn't do it all, and Murray State simply didn't have the depth or athleticism to stay with the Noles, losing 90-62. Racers players not named Ja Morant shot 2 of 12 from three, 12 of 40 from the floor, and added a combined three assists and one block. One player can be the difference between a win and a loss from time to time, but even as good as Morant was, he didn't have the supporting cast needed to go toe-to-toe with FSU. Throw a zone at Gonzaga, and the Zags will shoot you out of it. Throw man defense at them, and they will shred it like cheddar. Every time you try to zig, this team is capable of zagging (pun very much intended). This is the very best team remaining in the NCAA Tournament field. And after Saturday, it's hard to argue it doesn't boast the two best players out of the East Regional with Brandon Clarke, who scored 38 on an efficient 15 of 18 shooting in the Bulldogs' 83-71 win over Bayloer, in a game where All-America candidate Rui Hachimura was limited to six points. Add in the re-emergence and renewed health of Killian Tillie, the 6-10 center who can block shots, make threes and throw down rim-rocking dunks, and you've got yourself a near-flawless team from top to bottom that just might win the whole thing. Especially if Brandon Clarke is doing stuff that puts him in the same rarefied air as Shaq and David Robinson. Everyone wants to be Mr. March, the coach who notoriously is brilliant in the NCAA Tournament. But few are as notoriously brilliant in the NCAA Tournament as Tom Izzo. Izzo guided the No. 2 seed Michigan State Spartans to another Sweet 16 with a 70-50 beatdown of Minnesota on Saturday, a result that earned him his 50th tournament victory, good for fifth on the all-time list. Keep your Ja Morant triple-double, for my money, Purdue star Carsen Edwards laid claim to the best performance of the 2019 NCAA Tournament (so far) for what he did Saturday. Check this gaudy stat line: 42 points (career-high), six rebounds, 9-of-16 shooting from three. And check this final: Purdue 87, Villanova 61. Yes, the reigning national champion Villanova Wildcats. Edwards is magnificent as a scorer, but Purdue's team performance was equally brilliant. The Boilermakers made 16 of their 30 threes, forced Villanova to 27 attempts from beyond the arc, and squeezed out double digit scoring efforts from Matt Haarms and Ryan Cline. And all this while Nojel Eastern was hobbled! Edwards was great. Purdue was great. One of the most enjoyable viewing experiences of the first three days.